,,,Actually,although I'm already nearly not interested in Lithuania anymore,Druskininkai's town is nice to walk. Information center was working even on Sunday! besides, they gave me good travel book of all of Lithuania,,,should I repeat from 1st place of Lithuania?? Strange but,in some toilet I felt smell of Chinese noodle of Japan(it's most popular food in Japan). ,,,She told me many interesting Lithuanian tradition,,but Oh! I should have got up more ealier! Suddenly she found some car until Utena for me,so Suddenly goodbye to her and hitchhike has started 12:30---formerly autorace champion Jonas narrated me it's speed world with safety drive till Kaunas---Got to dark in Alytus,but gentle guy drove me even passed over 30km from his home till Druskininkai!7:30pm goal. NOW it's already 7 PM ,but I haven't decided yet even where I will go today,why because I'm tired of CSing and Latvian short trip was so impressive(too satisfied),I didn't want to travel today although I had to find host in winter!,,Try to knocking doors like my younger days?! Visited host's grandmother's house,and painter Sarunas Sauka's house. My Lithuanian trip "EPISODE 2" has started!,,,but I feel it's already episode 4 or 5 ?! I want to travel another country as soon as possible,,RIGHT NOW?! It was almost -30C before morning?! ,,,Excellent view from bridge,Daugava river isn't frozen but white vapor world,,we don't need to visit big nature somewhere,inside city already has great nature! ,,,Finally I will go back to Lithuania,but now it's already 3:30 PM in biblioteka of Kraslava,,,Hope to leave Latvia Today!? (update on 6 PM) Now I'm still in biblioteka of Daugavpils,it's already dark,,,But I still Hope to reach to Lithuania Today!? (update),,,Crossed Daugava river under the moon by walk,agressive question's driver with contacting someone by wireless radio(anyway I can't speak Russian),,,on the border,officer checked my passport! (since when? I don't remember! )I got nervous(driver might told about me to them? ),,,Zarasai at 7PM,I gave up to go to Utena(I had number of Zarasai's CSer)but,driver tried to contact to someone by wireless,I was afraid it might to police? but he found for me a nearby truck driver who will go to Kaunas!,,,finally,8PM at Utena.Thanks! Till noon I could arrived this town,though, stayed at Biblioteka till evening for CSing as I couldn't use Internet yesterday,,,if I stopped this way,I would have more free time but My CSing would become difficult,,,It passed already 2.5 yeas since I left Japan,but I still don't know how should I travel? ,,,tonight's host also didn't have Internet. Instead no address,there are only house's name by Latvian village's tradition.Elita suggested me "just ask to someone",because no tel No.,,but at 1st house,"Do you know Peteris?" "Yes,it's me"? !,,,Even if"You know,Elita?" ",,,No. ",it's OK! The furniture-make-artisan with a cat.He has a lot to talk,,by Russian(even if I know Russian only a bit).What a luxurious time of classic music by audio-mania with white forest view.He practices "Qigong" or "Tai chi chuan" everyday,of course special concentrated lesson to me had done eagerly! ,,,His face reminded me of my customer(I was working social service for old people in Japan),but gesture is like Bruce Lee,so when his home-theater-night started I requested Lee,but his choice was American terrible horror"The hills have eyes",,it was too shock for me(almost it's my trauma),I thought I'll never watch horror anymore. ,,On the road in the middle of nowhere,,feels like lonely wolf,dangerously cold (in such case,meaning of catching car changes),caught a car even back to Rezekne,and asked somewhere place to stay, they called to several people,,,,after all,they found and introduced me someone can host me,it was Vita. 4 kinds of church in 1 sight(like a open-air religion museum),and prison at backside,impressive Daugavpils'sunset! ,,,Walked 1 hour til hitchhike-point,stood 1 seconds till catch a car,,,tried to surf to Elita(non-CSer)'s cousin's husband's brother(non-CSer) in small town!? ,,,Aglona's magnificent splendid Catholic church!,,,Memorable buildings or views are always from local people's introduction. and disco of countryside. When I was in Riga a harf year ago,people told me they can walk on Daugava river in winter,,,now I'm walking on same river in Daugavpils! Now I realized what are Latvia and Lithuania for me.Lithuania is nicer!but I like Latvia because it's not nice(I hope Latvian don't read this)! I wanted to go back to Lithuania today,but I couldn't! because Natalja(CS-host) introduced me to her friend Elita(non-CSer),,,Oh! I've never seen such artistic decorated home-toilet ever before!,,and their friend who is correspondent of Riga's newspaper interviewed me! ?Lithuanian magic works in Latvia as well ?!? (18.Jan) Rokiskis' school's lesson, Rokiskis' paper's interview. (17.Jan) My itinerary from December was,,,Kaunas-Pasvalys-Panevezys-Kaunas-Simnas-Alytus-Trakai-Sakiai-Kaunas-village close to Ignalia-Rokiskis. I would go anywhere as long as somebody invite me,even to same place again,,,even Latvia?! (16.Jan) Suddenly I was invited to "Into the wild",,,NO!into the forest (just a picnic)! Sauna and jumping to water again. SORRY for not replying e-mail for long days to YOU! (15.Jan) If we couldn't tell by words,we don't need to do it,,,No! even if we misunderstood each other,it's better than no words. (14.Jan)It passed 3 months since I began to say "I will go to Vilnius soon",it means I already stayed Lithuania for 3 months,but I'm still planning to go to other places before Vilnius,as long as I can find CS-hosts in many places. ,,,In my last journey,I was backpacker for a half year,then since I was robbed backpack,I became small-plastic-bag-packer(and hitchhiker,door-knocker or anywhere-outside-sleeper),but then many people gave me something in more half year,so I could evolve little by little from naked to backpacker as before until got back to Japan. ,,,6 years later,I started journey again by backpacker,then I became CS-addict,now I can't leave each country soon,but I still haven't given up to return to backpacker(maybe). (13.Jan) She said,"Camera can't take picture same as what we've seen. ",,,even if it's same idea of mine,today I was sorry without camera in front of frozen Kaunas river in white world,,,most beautiful view in my Lithuanian trip. (12.Jan) No matter how I try to leave Kaunas,I come back here again and again(4th-times within 2-months),,don't ask me why? because I don't know why. (11.Jan)My Latvian friend Inga flew to Japan to live,I wish I could help her there. I have been meeting many people who wants to live there until today,,,but I'm not sure the day I want to go back there will come someday or not? It's a kind of love and hate,and now I might begin to feel it to Lithuania as well. (9.Jan)Alytus' paper' article about my New Year days. (8.Jan)Maybe it's a bad habit but today also my hitchhike was almost in darkness,thanks 9 drivers. Anyway Lithuania is better country to do it. Walking on snow lake around castle' island because it's frozen. Everybody of Scandinavian and Baltic people told me "You must come back in summer",but even if I could travel around Baltic Sea again,I hope it will be in beautiful white winter again. Many of drivers whom I hitchhiked answered "I know CSing though I'm not member." Today's driver(in the dark again)as well,but they invited me(it's 4th case in Lithuania! )to their house of Vilnius! Finally I almost reached to Vilnius!,,but wait a minute,tonight I'm in Trakai. (5.Jan)Now it's 2 AM,I'm writing this in host's family's house. I've heard something sound from downstairs.Everybody's sleeping in 2nd floor,this room is nearest to stairs. Maybe thieve is invading? I don't have courage to go and check it,what should I do?! (4.Jan)I was finding Today's host from last year,one CSer sent me a few long mails "You can stay here from 4th blab blab,my family are such blab blab,,,",I replied and ask mobile number,,then,NO ANSWER until Today.It often happens to me. There are another kind of answers only"Just come anytime" with number and address,but actual person was chatty,hospitable,active,,,Which is better ? (2.Jan.2010)It was almost first time that I could enjoy Takeshi Kitano's movie. "Achilles and the Tortoise"
(27.Dec)From 3rd times' Panevezys to 3rd times' Kaunas.On the way of hitchhike,getting dark soon again,But it's already normal for me. (26.Dec)Since this December,I stopped finding new CS-hosts,I'm visiting previous places and hosts. Thanks to host me even in Christmas days!! (16.Dec)Why I say I'm traveling by invisible hand? For example,this morning I dreamt about Panevezys strongly,so I decided to go back there again suddenly,even though I haven't contact to my previous host who I wanted to surf again,BUT,a moment when I arrived to Panevezys by hitchhike and got off the car,she appeared with shouting my name!,,,or,she might be a real shaman? (09.Dec)Finally I'm fed up CSing,couldn't ask to anybody til midnight,,,finally I surfed bench of train station. (10.Dec),,,I still can't ask to CS-hosts,but in library,next computer's student talked to and hosted me! Angel again,,even if it's male. It passed 1 year since I started moving almost everyday to another CS-host.Kaunas was extreme,sometimes I felt I was kidnapped into funny dream(even if I visited them from my side),,,but as I remember,all of my journey was like this even since before start CSing.I still lack capacity that accept such endless excitement.That's why I depress often.And I'm afraid of CSing in Vilnius would be longer(for example I stayed in Riga for 2 and half months). I mean,which year my travel of Europe can finish!? ,,Started hitcchike in late time again,in these days it's getting dark soon after 4pm,I was frozen by cold wet wind for 3 hours(for example,why I could survive winter Norwegian hitchhike because it's very dry and calm weather). 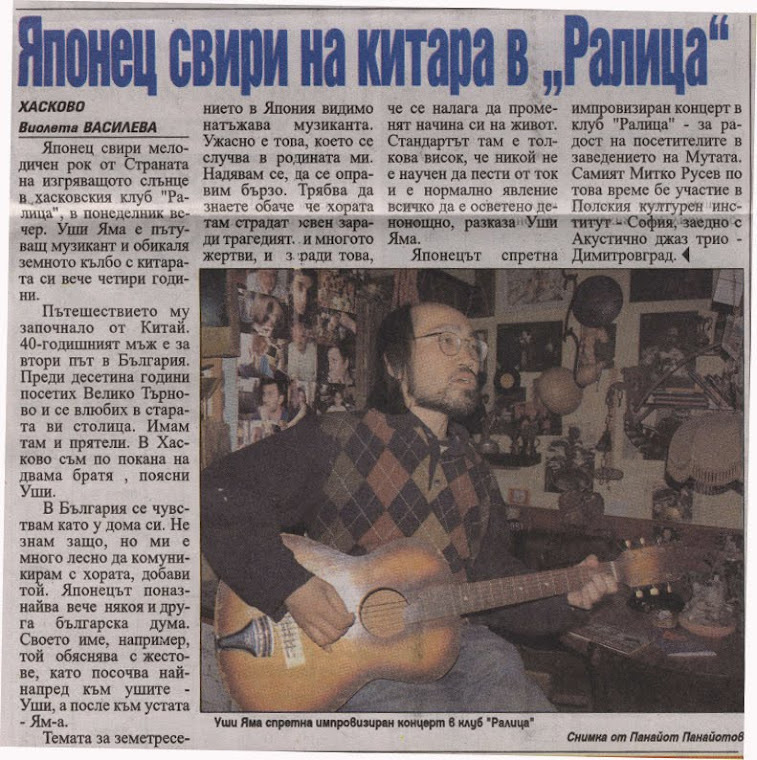 Today,2 newspapers of Lithuania published article about me. ,,,Why only Lithuanian newspapers wanted to interview me in several cities!? Surfing to CSer's parents without CSer was 1st time for me,quite nice,,,2nd time happened within same week! I can't catch up with my travel speed(No,it's not travel,just hectic CSing schedule),when I had 5 meetings within 24 hours,my brain had stopped. So I can't write references or reply e-mails(might be months later),,,Sorry! .Since springtime' Scandinavia,finally found host without CS!,,the driver whom I hitchhiked after sunset,invited me in village.I joined their Yoga! ?,,,and memorable couch. .Even after I left Latvia,magnetism of Riga is still powerful!Riga's CSer Ilona traveled to Lithuania by car and helped my hitchhike with whisper "You can come back to Riga with me",,,And now I'm traveling along border of Latvia. .True CSer from 20 years before CSing was born!,,when she was student,sent letters to far countries' student without noting address or name,just trying at random even without Penpal-organization.But she could find friends of a lifetime,Wao! .Palanga --- CS-host Robert wasn't there though,I could surf to non-CS-host by him!Cool artist from Moscow.Although her English is poor,we could rich talk and share soul by her passion. .Klaipeda --- It's been a long time since I joined prayer for meal with shake hands all together,thanks Junt将カ and family,I moved! besides,joined her birthday party. .Nida(of Neringa spit) --- Dune along coast in off-season,Fantastic! Robert found my host by phone again,thanks again!,,,but I still haven't met Robert. .In Ventspils.Thanks Linda for maximum pleasure! !USHI-concert to 200 students of her gimnasium was performed by her idea. .In Liepaja.Thanks Dagnija and M将ァrti将マ将゛!By seeing their circus performance,I realized what I want to do most. .Finally,I got out of Latvia! Thanks,Aleks to invite me your hometown close to Pilsrund将ァle!,,,but I still couldn't go out from Latvia.Thanks,CABBY to invite me to J将駻mala again! ,,,I was late to start to hitchhike but in rainy night,Mercedes guy drove me(over 100km passed by his home! )until Talsi with sometimes stopping cars at dark road in woods for his singing and guitar,,,Next mornig I got his SMS "when you looking to anything-you looking to yourself,because all is one."